Nestled on the southern tip of Gran Canaria, holidays in Maspalomas are ideal for those who like to explore, or spend days relaxing on the beach. The main attraction is the six kilometre stretch of beach, which is lapped by the clear waters of the Atlantic and backed by golden rolling dunes. The town itself is home to some excellent restaurants, bars, cafés, and shops, and has a lively atmosphere which is perfect for couples and families. If you’re looking for lively fun and activities, neighbouring Playa del Ingles has lots of shops, restaurants, and a few bars and clubs. Alternatively, take the family to nearby Aqualand, which is full of water slides and rides, or Sioux City, which is a Wild West themed park. If you want to explore the dunes, there are 4x4 trips, camel rides, and lots more available, as well as the chance to see the unique flora, fauna, and animals in this desert like terrain. Maspalomas is known to be one of the quieter resorts on the island, and offers plenty of opportunities to relax. Here you’ll find some of the best restaurants on the island, as well as designer boutiques where you can pick up unique gifts, clothes, accessories, and souvenirs. And luxury holidays to Maspalomas wouldn’t be complete without a trip to the iconic El Faro de Maspalomas, a 68-metre lighthouse overlooking the beach. Surrounded by pretty gardens and overlooking a seafront boulevard with designer shops, luxury restaurants, and bars, it’s ideal for a day out. 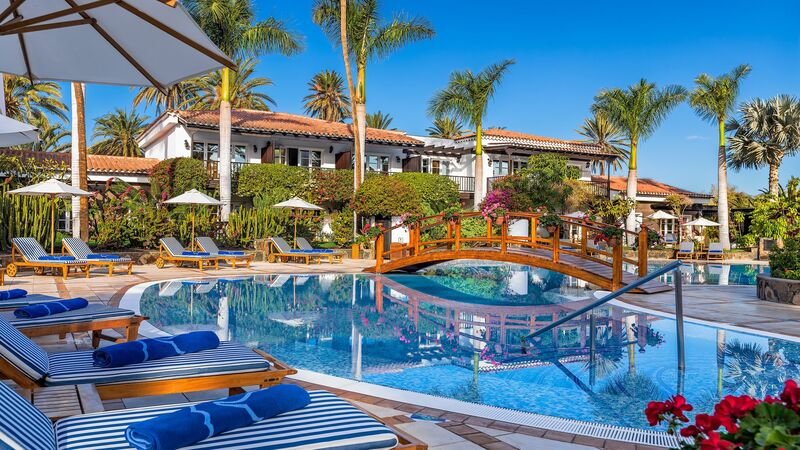 At Sovereign we’ll help you get the most from your luxury holidays in Maspalomas. All of our holidays come with private transfers and airport lounges as standard, and each of the hotels we offer has been tried and tested by our expert staff. Book your stay at the Seaside Grand Hotel Residencia for bright, beachy interiors, delicious cuisine, and a large spa with a wide selection of treatments available to guests. Transfer time from Las Palmas airport to Maspalomas is approximately 30 minutes.